Content marketing is one of the biggest buzzwords in marketing today - but if you're still unsure what it's all about see What is Content Marketing. However, if you're up to speed, here's a simple four-point plan to create valuable content for your target audience, which will help build your search traffic and fatten your lead database. If you want to catch fish, you need the right bait! The importance of market research cannot be overstated. It'll help you identify topics popular with your target audience and topics they are already searching for. Keyword research is a great way to investigate what your target audience would like to know more about. Online tools such as Google's Keyword Planner can help identify the questions your audience are searching for, which also relate to your product or service in some way. Once you understand what questions your audience are entering into the search engines, you can start to create content that answers these questions. Another approach is to identify the content that your visitors are reading on your site. In other words, find out which of your existing blog posts generate the most page views and elicit the most comments, likes and shares. If your audience like what you're posting, they're more likely to like, share, and add comments to it. And the reality is that if they don’t like your content, visitors will simply leave. But the very fact that they spent time on a particular page means a lot. Then click the folder that contains your blog posts. You’ll then be able to see the pageviews and the average time spent viewing each of your individual posts. This allows you to start identifying the posts that engage your existing audience the most. Of course, something to consider is that a page might have been viewed more because you've promoted it. Although this may not influence how long people spend viewing it. 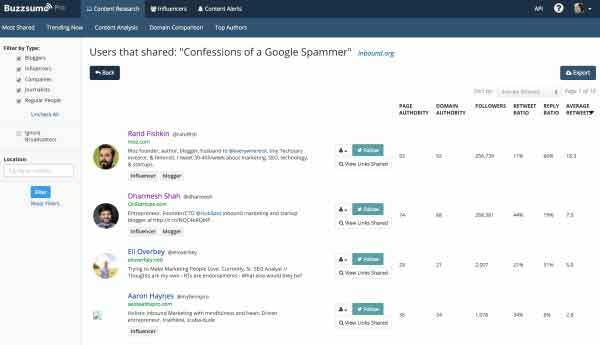 Tools that allow you to search and track content, like BuzzSumo, can help you identify content that has performed well by getting likes and shares within a topic area, or for your site or on a competitor's site. This allows you to see which topics generated the most social engagement. When would backlinks not be a good metric to gauge the impact of your content? Link building tools, such as Open Site Explorer, can give you a sense of what content gains the most inbound links. Ask your existing audience directly what type of content they’d most like to read. Any feedback can be helpful. You can then expand into related topics to solve their biggest problems. According to Neil Patel, content marketing campaigns perform best when they’re built on a solid foundation of high-quality and data-driven content. According to Copyblogger Media, 8 out of 10 people who see a headline will read it. However, only 2 out of 10 will actually go on to read the rest of the content. The better the headline the better chance you have of beating these averages. But instead of staring at a blank screen waiting for inspiration, maybe start by looking at what expert writers are doing and learn from them. Take a look at the headlines in established magazines and top blogs, written by journalists and copywriters who really understand how headlines work. And here's a handy infographic for headline writing that might help. Once you’ve got your headline, done your research, and gathered background information and quotes, it’s time to write. A good place to start is a clear outline of the subtopics you intend to cover. This will give a strong structure for your post, which will not only help you write it, but also help your audience read it. Writing flows and works well when the reader has a good sense of where they are in the journey and when they can almost predict what's coming next. Draft it, leave it long enough to forget it, then come back. This will help you self-edit your work with a more objective eye, your readers' eye, and spot the mistakes and any areas that go 'clunk', those sentences that just don't sound right for whatever reason. Next, repeat the process, but this time print your post - it's much easier to spot mistakes in hard copy. Your post should also be long enough to keep folk engaged. Recent studies show that Google tends to rank content that’s detailed more highly than shorter pieces. That doesn't mean you should pad it out with waffle though - after all, no one wants to hang around wading through tedious text. Life's too short, and there's always plenty of cat videos to watch. The idea of a content upgrade is to offer an incentive for visitors to part with their details. You've got them to your blog post, you now need to tempt visitors into exchanging their contact details for something extra, a content upgrade. You’ll already have seen this on other blogs. Within the blog post, you’re given the option to download a bonus report, or the content that you’re reading in a different format. So instead of having one catch-all upgrade that you give away, create a specific and valuable bonus for each blog post. As the upgrade is targeted at the people reading your blog post, the chances of converting them into subscribers are pretty good. A quick and easy approach is to convert your post to a PDF report for download. Don’t be surprised if you find a lot of people downloading the same thing they just read and submitting their email address in exchange. This gives folk the opportunity to read offline or maybe save and print your post for later. So, not only do you need great content and a content upgrade, you also need a post with an opt-in lead-capture form, whether it's on the actual page or in a pop-up that appears when the visitor is about to leave, for example. A good place to start is posting links to your new blog post on social media. You can also use tactics such as incorporating Facebook’s Open Graph tags, along with paying to boost Facebook posts to your followers and their friends, or to a custom audience of folk who’ve already visited your site but haven’t signed up yet. You could also include a link to the new post in your email newsletter that goes out to existing leads. This will help keep them engaged and hopefully they'll share your content with their social networks, driving more traffic to your site and yielding new leads. Social media outreach is another tactic to help with lead generation. It's a way to connect with influencers who will hopefully in turn support you in reaching more people. Something that might be useful here an understanding of the 5 steps to social media engagement. So, social media outreach is about following industry experts and starting to communicate with them. 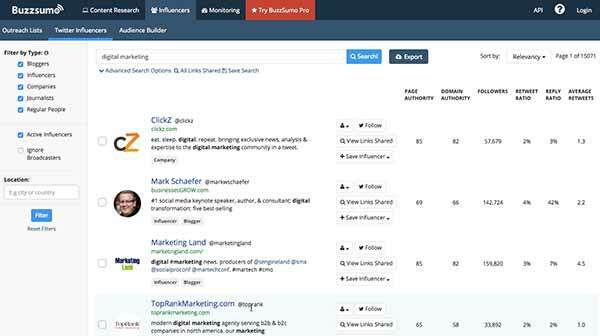 You can find thought leaders using tools like Buzzsumo... go to buzzsumo.com, click the Influencers tab, enter your main keyword, then click the Search button. You can now click on a person's photo and you’ll be taken to their Twitter page. This allows you to check out how many followers they have, follow them, and visit their blog and contact them directly. You may have to go through this process several times to find the right people relevant to your industry. Don’t be tempted to go just off the number of followers. It’s better to follow someone with a small loyal following than a celebrity with millions of followers. Anyone can start a blog. What’s difficult is attracting an audience that will keep coming back for more and eventually become your customers. To cut through the noise and generate more leads, focus on what your target audience is already searching for. Keep creating valuable and highly targeted content and you’ll increase your search traffic and attract more leads. And for a bit of practicing and preaching, you can download a longer version of this post at the top of this page.